We love hearing people’s ChiropracticStory. Here’s a repost from @organic_olivia about how chiropractic changed her life! 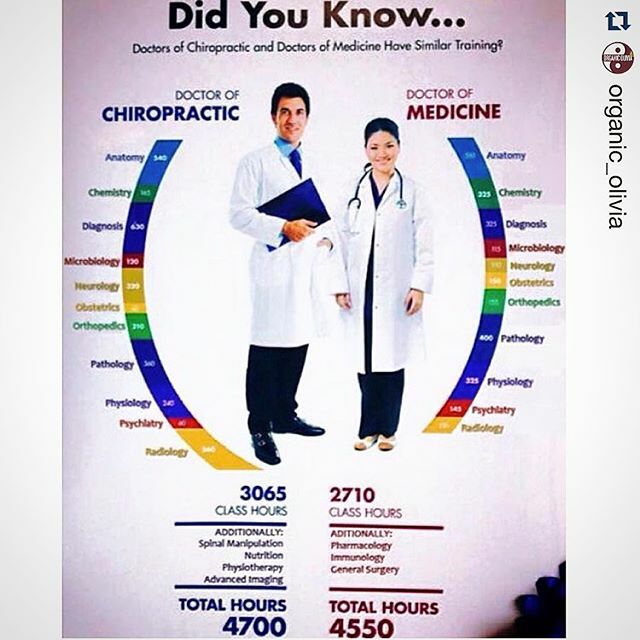 ・・・ Did you know that chiropractic doctors have just as much training as medical doctors, and then go on to study nutrition and the spine rather than pharmacology? Did you know that if you have a subluxation of any vertebrate in your spine, that the bone will compress the nerve it’s sitting on and cut off blood supply/nerve signals to your ORGANS?! An organ without proper blood circulation or nerve signal (electricity) slowly begins to die because it’s cut off from its energy/nutrition source (or Qi in Chinese Medicine). For example, if you have any misalignment of the vertebrae in your lower back, the nerves that connect to your kidneys and/or uterus will be pinched (you usually will not feel pain until it’s serious!) This can cause infertility, menstrual cramps, and so much more simply because the Qi/life force flowing to those organs is now stagnant and blocked. . I have been going to my chiropractors (a husband and wife team) 3 times per week (because my insurance covers it so I thought why not?) and I was SHOCKED at what my spine looks like. Please let me know if you’d like me to post a picture of my x-ray and the chart of organs that my vertebrae are pressing on. I apparently have had some slight scoliosis going on all my life & did not know it! But my health issues sure make sense in hindsight, coupled with my poor eating habits and pharmaceuticals growing up.